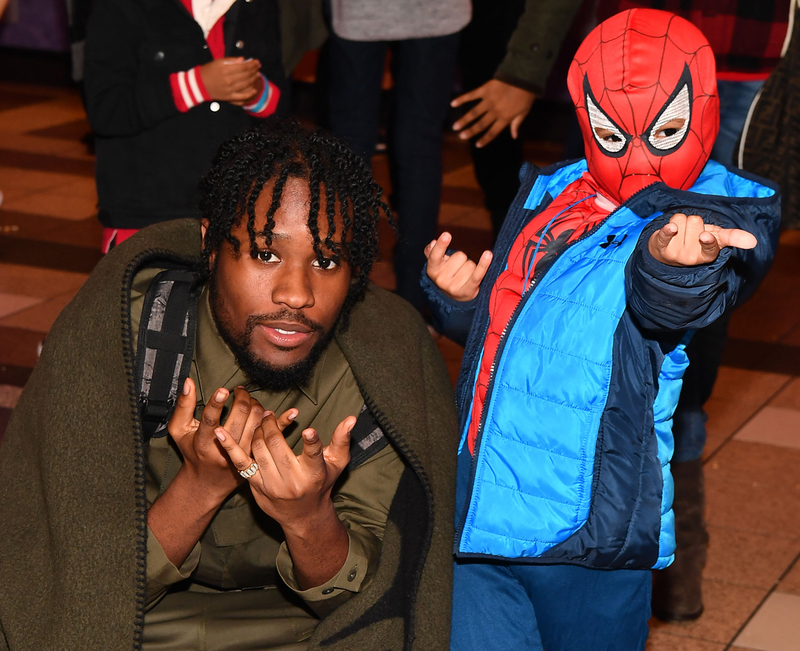 Shameik Moore poses at a California premiere of his new film, Spider-Man: Into the Spider-Verse. One of the biggest films of this Christmas season, Spider-Verse welcomes Miles into an inclusive world where he is the latest of many versions of Spider-Man. 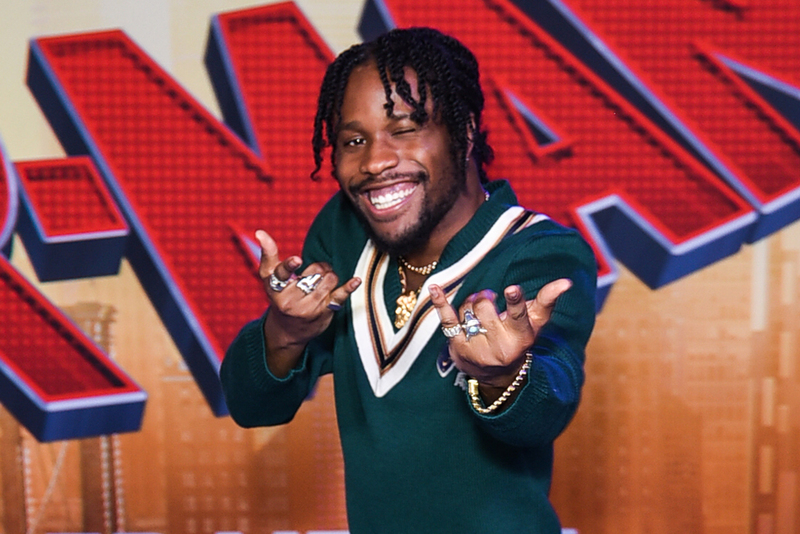 He navigates his complicated, yet loving relationship with his father (voiced by Atlanta’s Brian Tyree Henry), a new school, hanging out with his beloved uncle (voiced by Mahershala Ali), and accepting his new abilities with helping his new Spidey friends protect New York City from the bad guys. The film has already earned a Golden Globe nomination for Best Animated Motion Picture and is expected to be hit at the box office this weekend. A week before the film came out, Moore hosted a special Atlanta screening at Atlantic Station with many of his family and friends present. The next morning Moore, who splits his time mostly between L.A. and New York, spoke to Atlanta magazine about his latest milestone and why sharing his work with Atlanta is so important to him. Every time you have a project, you make it a point to host an Atlanta screening. Why is that so important to you? I grew up here. I’m from Atlanta. My mom and dad are here, my brother, all my friends growing up, all the people I danced with. I could have filled up two theaters if I had the opportunity or space to do that. Atlanta is the place where it’s most important to bring my people together. And every time I have a project, I try to have a screening or premiere for my loved ones to really see what I’ve been working on while I’m gone and they don’t see me or hear from me sometimes. When my projects come out, they always know that they have a chance to get dressed up, brag and bring their girlfriends and boyfriends, nephews, everybody. It’s a special time for my loved ones to share a moment with me. Moore poses with a young fan at the Atlanta premiere at Atlantic Station. How is Spider-Verse different from your previous projects? Besides it being animated, it’s not that different as far as the process. It took two years to make The Get Down. It took two years to make this. I’m working with some very creative people, [producers] Chris [Miller] and Phil [Lord] and our directors Bob [Persichetti], Rodney [Rothman], and Peter [Ramsey]. I guess the difference is the little dude’s voice sessions. Probably every other month we’d do like three or four sessions, then I’d go about my business and come back, versus being on a regular set where I’m on set every day until it’s done, 18 hours or whatever. I think that’s the biggest difference. As you’ve made the promo and press rounds, has the magnitude of starring in a Marvel film hit you? I don’t know if that’s hit me yet. I think the box office numbers will make that [real]. After the screening you took pictures with lots of little kids—that wasn’t the case with Dope or The Get Down. I take the responsibility of that. With great power comes great responsibility, for sure. Do you see an opportunity to come and film in your hometown? I would love to work here, but it really just depends on the project. It would be great to work here. Hopefully, maybe my movie that I’m writing will film here. How has this experience inspired you to continue on that screenwriting journey? The writing on this movie is amazing. They did a great job really putting it together. There were are a lot of people involved, but I felt like I was a part of that process in seeing what lines got thrown out and what ended getting used, what the story was originally, and how they developed it over time, just pushing the bar forward. Not just settling with the original idea, but really taking it and pushing it and making it what it’s supposed to be. That’s the biggest lesson. Hip-Hop has been really central to your starring roles so far. Has that been intentional? Well, that’s a part of my personality. It’s part of who I am. Really I’m just strategic about what [roles] I accept. I think I bring that essence to the table. I have two movies coming out that are less hip-hop involved. I don’t know that Spider-Man is hip-hop. I think the music he listens to is modern hip-hop and R&B. But The Get Down, that was more like I was the original bad boy of hip-hop. That was the ‘70s before hip-hop was created. And then with Dope, I was just in love with ‘90s music in general. That’s me bringing a little bit of myself to each character that I play, and I think hip-hop helps define who I am. Yes, Spider-Mans of old didn’t feature hip-hop music. It’s the new world. It’s the new time. This is what’s relatable for our world now. I think hip-hop is the most listened to music on the planet right now if I’m not mistaken. It’s the genre right now, so it makes sense. You said you’re strategic about the roles you take. So what it is the thing that connects all of your roles? Just iconic characters. I want to play characters that I feel that will be unique for me. A lot of the good stuff that I turn down [is because] I don’t really think that they need me to do it. A Miles Morales movie for Spider-Man, I think, is not something that everybody can really pull off, not in a way where it’s going to be iconic. I want to play characters where I can bring a real energy to it to make the audience feel something. I want to express parts of myself that I know will have people connect to me. Because ultimately I want the power to inspire people. I desire to inspire people to make a difference in the world. Ultimately, that’s the biggest goal. When you started acting, Atlanta wasn’t yet the Hollywood of the South. What made you think you could do this? How did you get here? I never thought I couldn’t do it. That’s the honest truth. It’s about where your mind’s at and how bad you want it and what you’re doing to get there. Eating healthy, meditating, working out, having a positive energy, and knowing how to talk to people—how to turn it on and off and when you need to be by yourself—[is important]. And when it’s time to work, it’s time to execute. They used to call me “the delivery man” on set. On The Get Down, they would give us a script—a two-page monologue—and they’d give me 10 minutes to get it. Then I’m in there and I’m killing it, and they’re like, “This is the delivery man; he gives us what we ask for.” I never questioned whether or not I was going to make it. Where do you go after the Spider-Verse? To bigger and better places.